A lone fiddle strikes up a rhythm and, as the rest of the band joins in, the caller gives the first call of the night, “Balance and swing your partner!” Scores of dancers come together, swing in place, then break to form a Left-Hand Star. As the music continues, the dancers spin and weave their way across the floor. Seen from above, the patterns they create would reveal an intricate choreography that seems always on the point of collision and collapse. Close up, it’s all smiles and faces flushed with laughter. It’s the first Saturday of the month, and the monthly Goshen contra dance is in full swing. Literally. Contra dancing is a traditional American folk dance that emerged from English country dance, Scottish, and French dances dating to the 17th Century. The dances are family-friendly, open to new dancers, and don’t require any previous experience. Goshen Community Contra Dancing, a non-profit organization dedicated to promoting American traditional folk dance, music, and song in Goshen, sponsors the dances. Contra dancing is a called dance, similar to square dancing. Since every dance is different, the caller begins each dance by walking the dancers through the figures. After the music begins, the caller continues to cue the dancers to the next move. Once the dancers have it down, callers often drop out, letting the music take over. Unlike square dancing, which takes place in a square of four couples, contra dancers are arranged in two long lines. Dancers are paired with the person across from them and as the couples progress up and down the lines they dance with every other couple in the line. 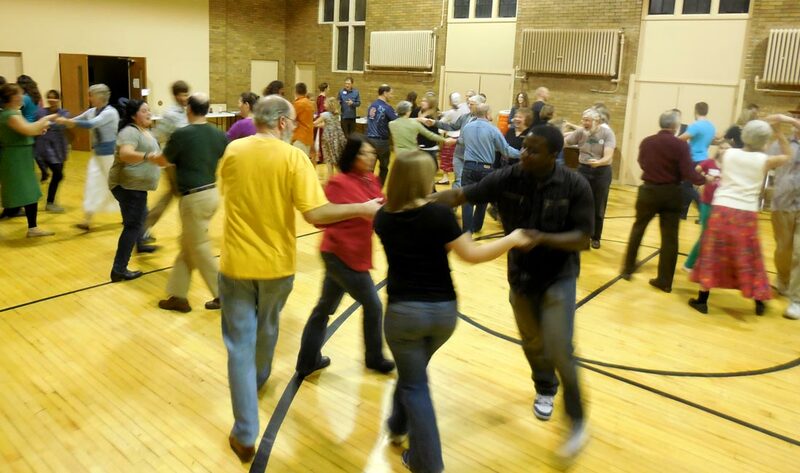 Contra dancing is a social dance and no one needs to bring a partner. It is tradition to change partners with each dance. A live band accompanies every contra dance, usually playing Old-Time, American folk, traditional Irish or Bluegrass music. It is one of the few opportunities in Goshen to dance to live music. A good band can match the tempo to the mood of the dancers, starting slow and increasing the intensity as the dance takes hold. Goshen College student and musician Sadie Gustafson-Zook has been attending contra dances with her family since she was a child. Phil Good-Elliott met his wife Carol at a contra dance in Chicago in 1993. When Good-Elliott moved to Goshen in 2001, there was no regular contra dance. So he put the word out that he was interested in starting one and a group of dancers, callers, musicians and volunteers began to form. “It was very much a community effort,” he said. The group held its first dance in October 2001 in Goshen College’s Leaf Raker Snack Shop and 50 people turned out. Two months later, over 100 people showed up to dance and they moved to the Union Gymnasium. Today the dancers do-si-do and promenade in the gym at First United Methodist Church in downtown Goshen. According to Jennifer Dawn Byler, a board member for Goshen Community Contra Dancing, contra dancing is a great choice for beginning dancers. Dances draw from a “vocabulary” of about 20 basic moves. The caller puts those “words” together to form a “sentence.” Once the basic vocabulary is learned, a dancer can quickly learn a new dance. Still, mistakes happen, even with experienced dancers. When that happens, the general response is to smile and keep dancing. An evening of dancing often includes a smattering of other social dances like a waltz, a schottische, or a square dance. Goshen Community Contra Dancing invites new dancers, young and old, to join in the fun. The group hosts dances on the first Saturday of the month (excluding July and August), from 7:30 p.m. to 10:30 p.m. A beginner’s lesson is taught at 7:00 p.m. The dances are held at First United Methodist Church, 214 South 5th Street.